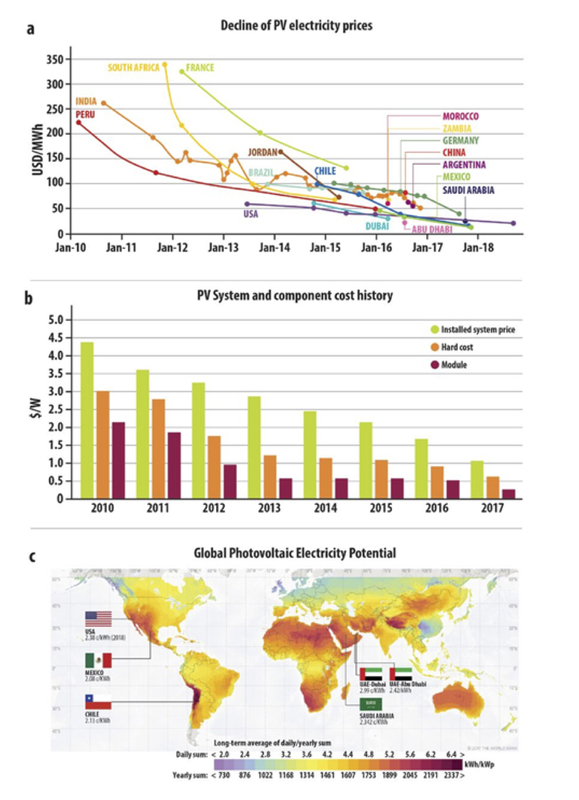 Our paper in Nature Energy, 'Evaluating the factors that led to low-priced solar electricity projects in the Middle East', sets out to explain a recent development in the solar energy industry that has repeatedly surprised observers over the last several years: the sudden emergence of extremely low-priced utility-scale PV projects in parts of the world that had previously shown minimal interest in renewable energy. This story had particular interest to us as we are all professionally based in the United Arab Emirates, which effectively announced the arrival of ultra-cheap PV electricity with the first-ever PV power purchase agreement for less than 3 ¢/kWh see Figure below. The surprise and skepticism surrounding that announcement drove us to take a closer look at the issue, and ultimately share our findings with the community through this article. Our closeness to the story undoubtedly gave us useful insights into some of the conditions leading to the low prices; however, in the end we had no more information about the specific details of the bids than could have been obtained from various public announcements and financial analyses by the general public. Therefore in the end we settled on a bottom-up modeling approach that, rather than trying to offer a definitive “insider” take on these projects, attempted to rederive or reverse-engineer them, based on publicly available data and our knowledge of the region. The paper makes a number of key findings regarding the origin of the low PPA (power purchase agreement) prices, laying out the impact of improvements in project design, including the widespread adoption of single-axis tracking in clear-sky locations, high inverter-loading ratios that improve plant capacity factors, and longer contract terms; technology improvements including the improved reliability and, most crucially, the greatly reduced price of PV modules relative to just five years ago; and, critically, improved conditions for project finance which can be attributed to multiple sources including increasing confidence in the bankability of solar power projects, globally low interest rates and a dose of state encouragement. These are supplemented by a number of local factors, including the low cost of labor and the likely waiving of some fees for a favored developer, that are unique to the region and could not be argued to be applicable elsewhere. An important aspect of our analysis was to consider the degree to which the experience of the UAE can provide a model for other markets, which is dependent on how these unique conditions may be imitated elsewhere. To this end we have included discussion of the ways in which prices below 3 ¢/kWh have begun to be replicated around the world in the past year, through such moves as the involvement of international players with access to capital that could not be gotten from the domestic market, or clever engineering decisions that cut costs in ways that approximate the waiving of certain fees or responsibilities in the UAE. A final aspect that factored heavily into our writing process was the question of how to “to bridge the gap” between industry experience and academic literature. In a fast-changing field such as solar energy, economic and technical realities “on the ground” can change much faster than the academic publishing timeline. As a result, the body of academic literature is almost invariably, and unavoidably, out of date to some degree from a business or industry perspective. In order to keep our analysis is up-to-the-minute, we decided to take the unorthodox step of referring heavily to newspaper articles, press releases and reports from industry publications. In this way we essentially “enter into the literature” information that may be less accessible to academic researchers due to not being previously published in an academic setting.